One of the most common questions we get about Adjustment of Status (also known as AOS) is whether or not one can adjust their status on an expired visa. Unfortunately the government isn’t absolutely clear about each type of case. There’s even language that seems partially contradictory in the form I-485 instructions. If you have a case that requires legal advice, you should contact an experienced attorney. But section 6A and 6B would suggest otherwise in the case of immediate relatives of US citizens, or K visa dependants who married the petitioner within 90 days of entering. This exception appears to allow immediate relatives and K visa dependents to adjust their status even if they are on an expired visa. 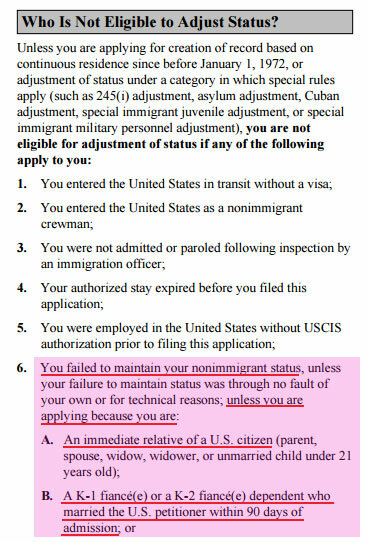 The most common occurrence RapidVisa gets with this type of case is when a K1 visa holder doesn’t adjust their status before their visa expires. They’ve married the petitioner, but haven’t had the need to work or leave the US, so they wait quite a while to file for the adjustment of status. In our experience, the vast majority of these are approved, likely due to the above #6 guideline. Though you don’t need to adjust your status immediately, there are still many reasons you should, such as being able to legally work. What about adjusting status on an expired tourist visa or visa waiver (ESTA)? The second most common type of customer asking this question is someone who entered on a tourist visa, or on visa waiver (ESTA), but didn’t adjust status before they overstayed. According to the I-485 instructions, it would appear these should fall in to the #6 guideline if they are married to a US citizen. See our article “Can I Adjust My Status if I Get Married in the USA?“ for more basic information about adjusting status based on marriage. Which cases can RapidVisa help with? To wrap up everything mentioned in this article, we can help you adjust your status if you are married to a U.S. Citizen or are the step-child of a U.S. Citizen and entered the US legally through one of the visa types on this page, regardless of if your visa is currently expired. Our Adjustment of Status service includes all forms needed to get your Advance Parole (travel permit) and Work Permit. We get 99.7% of these cases approved every day. Our value proposition is unmatched. If you still have questions, give us a call right away at 719-208-7033, or toll free at 800-872-1458.